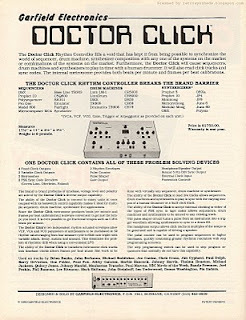 Garfield Electronics Doctor Click Rhythm Controller advertisement from 1983. The ad on the left is from page 13 of the February issue, and the one on the right is from page 65 of the June issue. Garfield quickly caught on that their original ad (in place for only a couple of months) was running a little low on actual info. Tech guys in the studio would be in need of a lot more information about this device before shelling out a grand or more. And, not sure if they realized it at the time or not, but Keyboard magazine's review for the device wasn't going to be published for at least another nine or ten months, limiting user knowledge of the machine even further. So, Garfield needed to get a lot more information out there. And fast. That is exactly what this ad does. 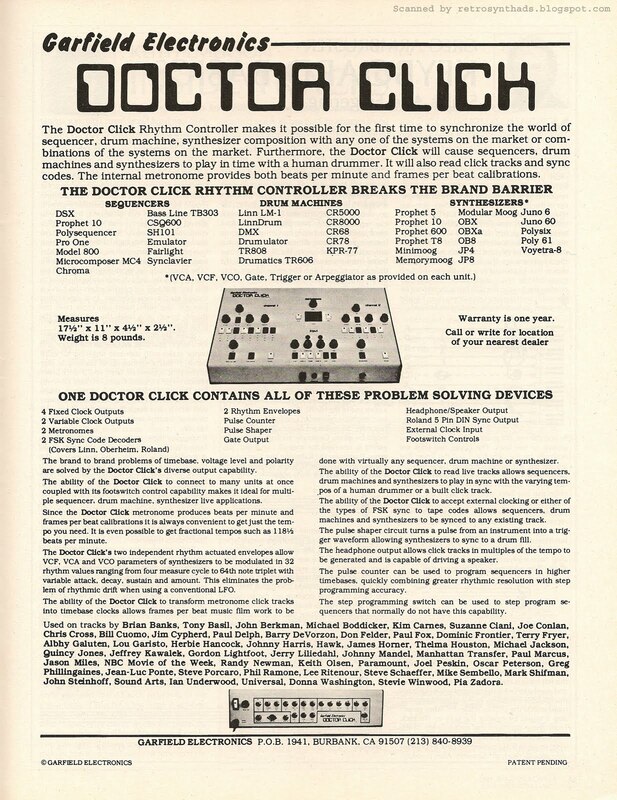 The ad itself is divided into five basic sections - title, intro, list of compatible devices, problem solving, and finally some name-dropping. And together, they almost make up a whole article on Doctor Click. For interests-sake, I've included scans of both the first and final version of the ad. I really like looking at how ads gradually change over time, and this one went through several small changes between its introduction in February, through to the final June version, which then ran in Keyboard until January 1984. I've included a list of changes below, and it's almost as interesting to note the devices and names that had been dropped rather than added (although that's mighty fun too!). You can see that both the Moog Rogue and Kraftwerk were both added in the March version, and then unceramoniously dumped the next month. Booo to both of those! The OB-SX was dumped as well in April. Meh. As a Canadian, I always find it interesting when I see Canadians appearing in Keyboard ads - the addition of Gordon Lightfoot in this case. The one thing I don't like about this ad, but that couldn't be helped with all that ad-copy, was that the photos of the machines had to be shrunk significantly. Not too mention the photos are in black and white. The machine looks much better in colour. 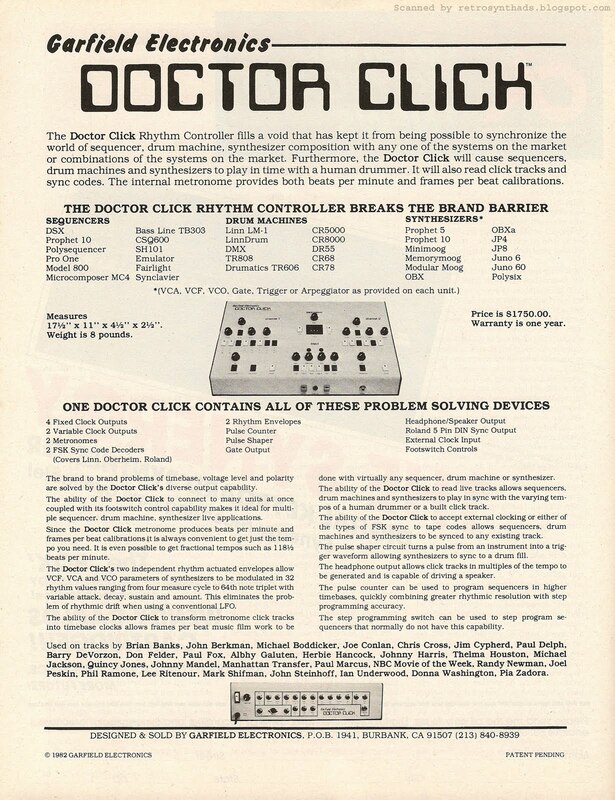 There are surprisingly few photos of Doctor Click online. The 2008 MATRIXSYNTH auction post I threw at you in my last blog post has a couple of good photos, along with some good reference info. Another MATRIXSYNTH auction post from December 2009 also has some good large photos. Click on the images and expand to full size to really see some great detail. You can see all the labels on the back panel, and you will notice that the front panel 'tempo' indicator uses what looks like to be rotating-dial numbers. Very retro! I like that a lot. 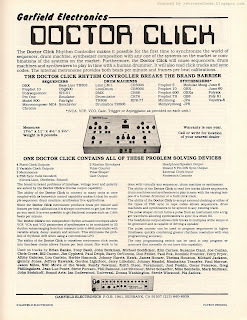 At the end of my last blog post, I made the comment that I shouldn't really find it amazing that Dr. Click's existence is in large part due to the historical paranoia that synth companies had with each other. Maybe paranoia is a strong word. Bob Moog has referred to it in the past as 'the business climate'. So, in other words: The historical business climate made it next to impossible for companies to try and work together (that *will* have to wait for a future blog post). And I say historical, because things were about to change with MIDI. But for now, products like the Garfield made it clear that users wanted to buy Company A's product and wanted it to work with Company B's product. Maybe, in some way, Pia Zadora and all those other famous users listed in this ad were making a statement when they bought a Garfield. Effectively telling all those manufacturers that they wanted to use many different brands - TOGETHER.